“The Perfect Crime” was one of the relatively few episodes of Alfred Hitchcock Presents directed by Hitchcock, himself, and its dramatic polish reflects the craftsmanship of “The Master”. 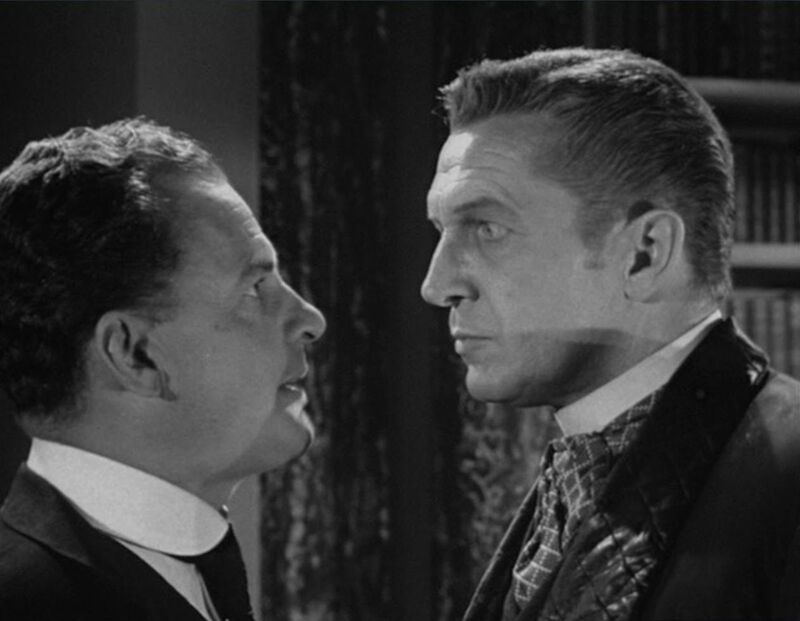 Based on a story by Ben Ray Redman and scripted by Stirling Silliphant (who also wrote the teleplay for the earlier “The Glass Eye” episode), the episode, like many others of Alfred Hitchcock Presents, featured some well-known character actors, in this case Vincent Price and James Gregory. 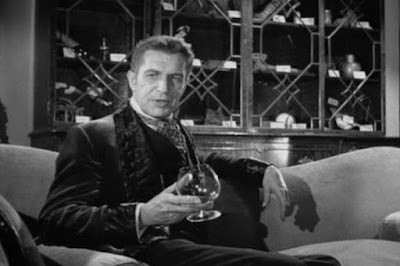 The choice of Vincent Price for this story was particularly apt, since the character he plays is an intellectually snobbish supersleuth and connoisseur of the arts. Price, whose long career dated back to the early days of Orson Welles’s Mercury Theater, was himself a Yale graduate and art connoisseur. The story first introduces us to Charles Courtney (played by Vincent Price), who takes great pride in his work as a detective and prosecuting attorney, which invariably ends in success. He is visited one evening by John Gregory (James Gregory), a defense attorney who has lost in court to Courtney on many occasions, including a recent case that resulted in Gregory’s client’s execution. Courtney begins discussing his work and show Gregory his showcase of ornamental artifacts referring to the damning evidence he found in connection with his cases that condemned his accused. He has one empty position in the case that is reserved for what he thinks is impossible: the perfect crime. There is always some corpus delicti, he claims, that can be found that will lead to the conviction of the accused. We also learn that Courtney makes artistic pottery and even has his own kiln at home for baking the pottery clay. But Gregory wants to discuss the recent case involving his client, which he says resulted in an erroneous conviction and execution. Courtney, of course, disdainfully says that it is impossible that a mistake could have been made. Undaunted, Gregory tells Courtney that he is cold-hearted and self-obsessed; and then he begins to go over the evidence concerning the case. Gradually, he shows how Courtney missed some clues and misinterpreted some other evidence. Eventually, he convinces Courtney that a terrible mistake really was made, and then he threatens to reveal this information if Courtney doesn’t change his attitude. Courtney’s response is almost immediate: he chokes Gregory to death. The action now shifts forward two years, and Courtney has just returned from a two-year trip abroad and is jovially showing some guests his trophy showcase of artifacts associated with his successful prosecutions. In the place that had been reserved for the perfect crime is now a large clay pot. Viewers of this episode may be reminded of Roald Dahl’s famous story, “Lamb to the Slaughter”, which served as the basis of a later Alfred Hitchcock Presents episode of the same name that same year. In both cases the corpus delicti was right there in front of everyone, but in a different form. The key dramatic element in “The Perfect Crime”, though, that distinguishes this episode is the fascinating face-off between the contrasting, emphatic personalities of Vincent Price and James Gregory.